Here’s a high protein salad that is bursting with flavour and nutrients. Try the simple homemade salad dressing – it’s much healthier than store bought dressings, and still lends lots of flavour. 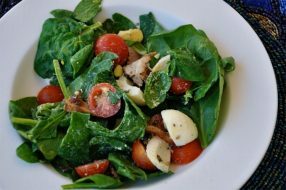 This delicious recipe for Spinach Salad is a quick and simple meal that’s filled with fibre and protein. For a complete dinner, add a grilled and sliced chicken breast. Dinners like this will get you well on your way to transforming your body and are perfect for warm summer evenings. Pack the leftovers for a wholesome, fat burning lunch.